There is no place on Earth like this, so come witness the Hatchet Throwing Experience for yourself… Bringing people together, one bullseye at a time! 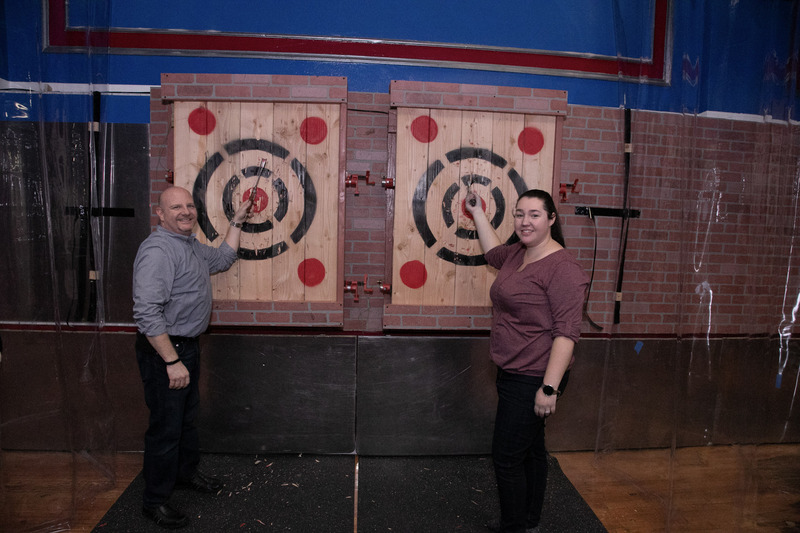 Axe Throwing is a perfect way to celebrate a special occasion, organize a team building event or simply have a great time with family & friends. 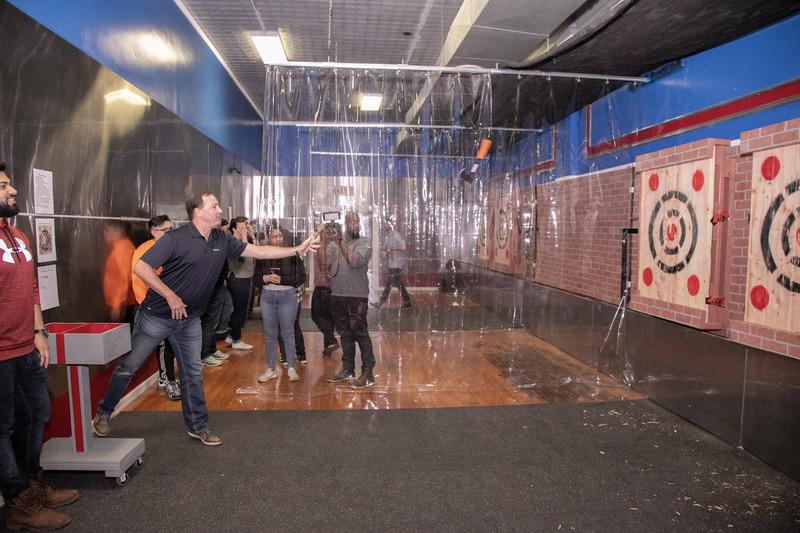 Axehole’s Hatchet House NJ is the only axe throwing club in the world that offers Escape Rooms, Human Bumper Balls, Rage Rooms, Virtual Reality, Airsoft, Paintball & Minutes 2 Win It & on-site dining & meeting room all in the same location. We are the premier and only destination of its kind for birthday parties, corporate events, bachelor & bachelorette parties & all other types of special occasions. 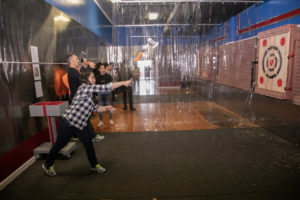 Whether it’s to pick up a new hobby, learn a new skill, take out some aggression, experience things you have never dreamed possible, our unique experiences’ are offered in a fun & casual atmosphere. 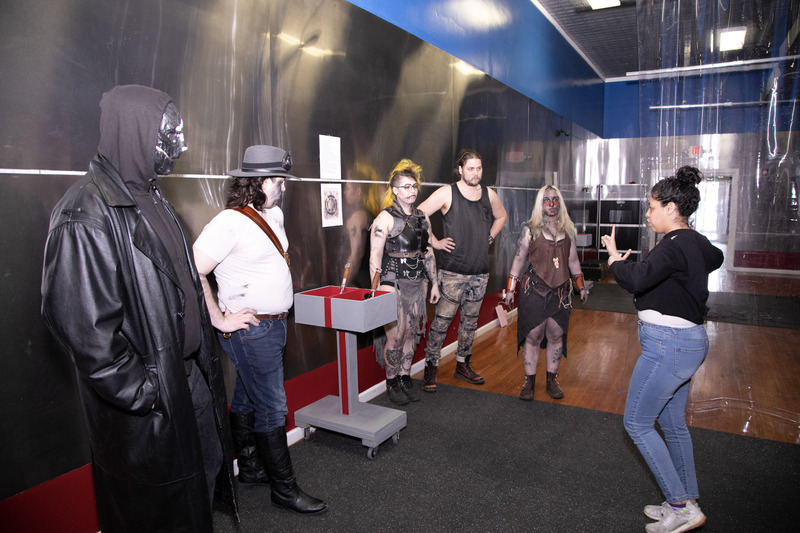 We have several types of experiences, game masters, ax-perts, instructors and many packages to make for an unforgettable experience. 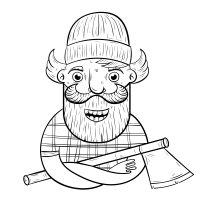 This sport isn’t just for unshaven lumberjacks, it’s for everyone! 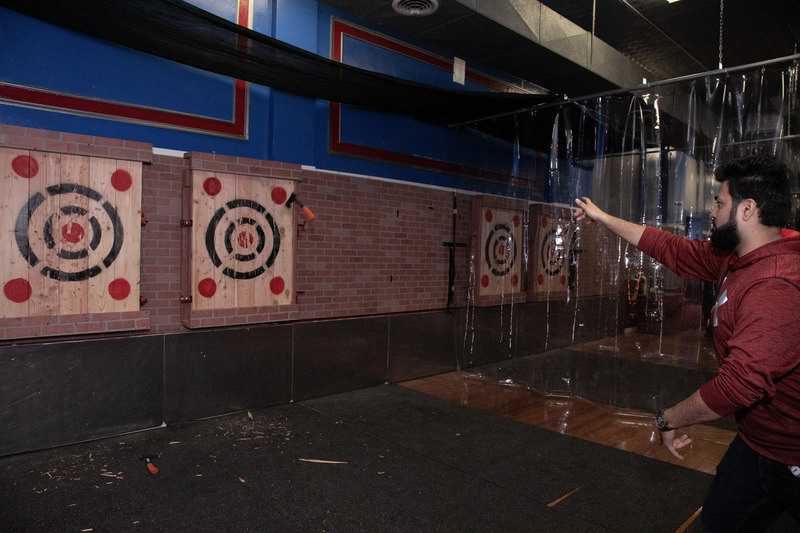 You’ll experience the thrill of throwing axes in a fun and social atmosphere. Perfect for your next get-together, birthday, hens, bucks or just because you want to give something different a go! 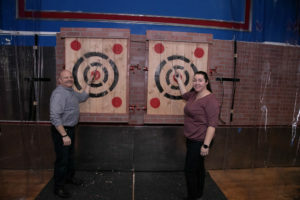 Host your next team building event or work party at Hatchet House NJ. We have a variety of corporate packages available to suit any occasion and budget or talk to us about customizing a package to suit your team. Remember: teams that throw together, grow together! Looking for an interesting approach to your holiday party? 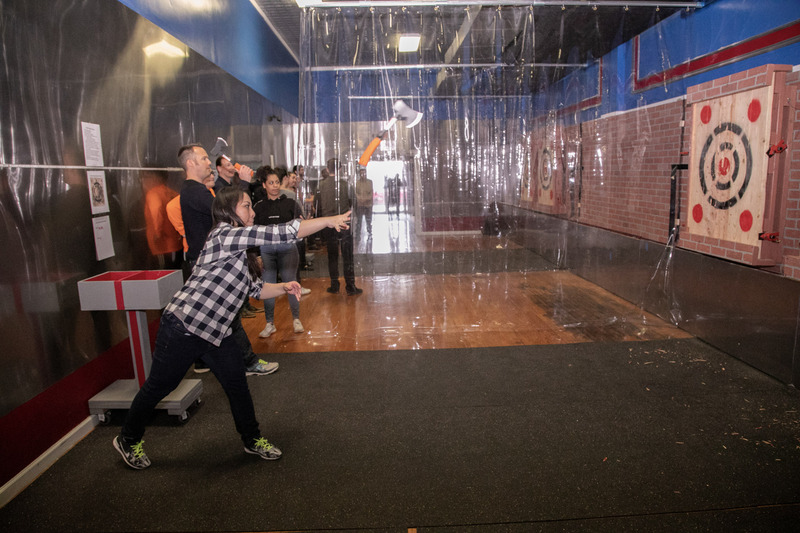 Mix the thrill of hatchet throwing with some delicious fixins’ in our party for a celebration no one will forget! Primitive and organic, this sport suits those who love adventure, those who seek a release. Please call in or email us for 45 guest and over! Escape Room, M2WI, HBB, Airsoft, Paintball, Hatchet Throwing, Rage Room (time only included, BYOB), Virtual Reality Games. Why would I want to throw axes? Well because everyone is doing it…..seriously, check Instacrack, Facesmack, Snachchap….O, come on you know what I mean! How much do Axehole’s pay & do I have to pay up front? The cost is $25+tax/pp for a shared lane, private lane prices vary. 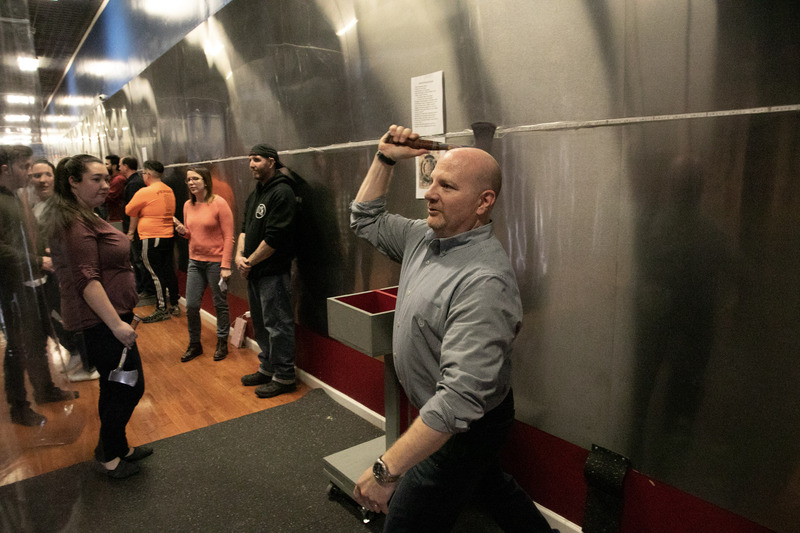 Our visits are 2 hours long which includes time for each guest to be trained on exactly how to throw by one of our skilled Ax-Perts. You pay when you make the reservation online. 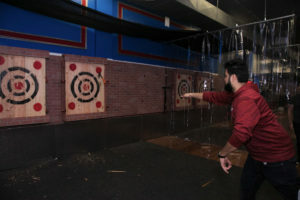 Packages with multiple activities including Hatchet Throwing will have 1hr of throwing time plus time for the other activities. Can I just bring my Axe on over without a reservation? Walk-in’s are welcome but availability is not guaranteed unless you have a reservation. Drop by anytime and if you can’t get in, you can always come back and try again next time! Booking is done online and If it shows spaces are available, your best bet is to just reserve online! 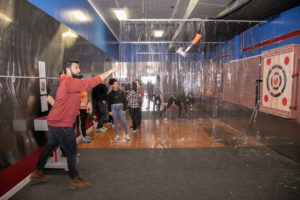 Do I need a large group to throw? No! Those that don’t have larger groups and don’t mind potentially throwing with strangers or having their group split between ranges can book a shared game. Otherwise please book your Axe a “Private Lane”, if you are not into sharing and all! My friends booked & we want to book, can we be together? Let us know if you are booking with other parties and all want to be together! We will do our best, but the foolproof way is to all book under one name. Can I book a private lane for six if I only have 4? Sure, if you pay for the minimum 6 for a Private Lane, you don’t need to bring that many, it just ensures no one else will be throwing with you! I don't want to throw, I just want to come hang with my friends and watch, is that ok? Sure, you’re welcome to come watch. There is a $10 spectator fee. What ages can throw at Axeholes? 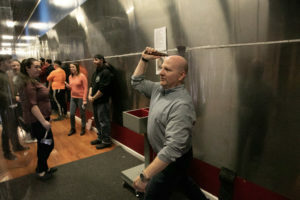 Ages 18 and up as long as they have the strength and coordination to effectively throw an axe as judged by our Ax-perts. All guests must have a state issued legal ID at the time of check in. No ID, No Admittance, No Refund, No Reschedule! Parents can bring their kids that are at least 12 years old, must book a private lane and stay with them at all times. We try to accommodate you if you are late, and as long as you have a private lane you will just have less time to throw. However, if you do not have a private lane reserved for your group, that means other groups are with yours and they get upset if we have to stop their throwing time to go over the rules & the instructions on throwing for you when they’ve heard it all before and they arrived on time. So please don’t be a late axe, get here early and have a BLAST! Basically… we won’t allow you to join the current group if you arrive after your scheduled start time. You are fine if you have a private lane and can just start when the entire group has arrived, or if it is a non-busy time, but if you are a small group that didn’t reserve a private lane, we can’t accommodate you for the above reasons. Each range has a dedicated Ax-pert that not only teaches the rules, but coaches you on how to throw. 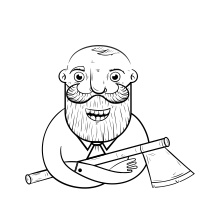 You will never ever be in the range without an Ax-pert! 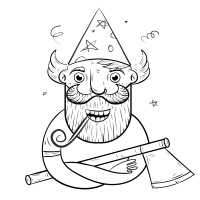 People that decide to get a membership will be allowed to throw without an ax-pert after showing proficiency in the rules and throwing. What should I wear? Do I have to wear a plaid shirt? Do I have to grow a beard or get tattoos? *Closed-toe shoes and absolutely no slippers, slip on’s or heels. *Comfortable shirt which gives you full range of motion. Is the space handicapped accessible? Can I throw if I am in a wheelchair? Unfortunately, due to insurance restrictions, we can’t allow that. So leave your axe at home, but feel free to bring the old ball and chain if he/she is available! Where can we find our photos? We post each pic on our Facebook & Instagram in albums by date and location. Please tag yourselves! 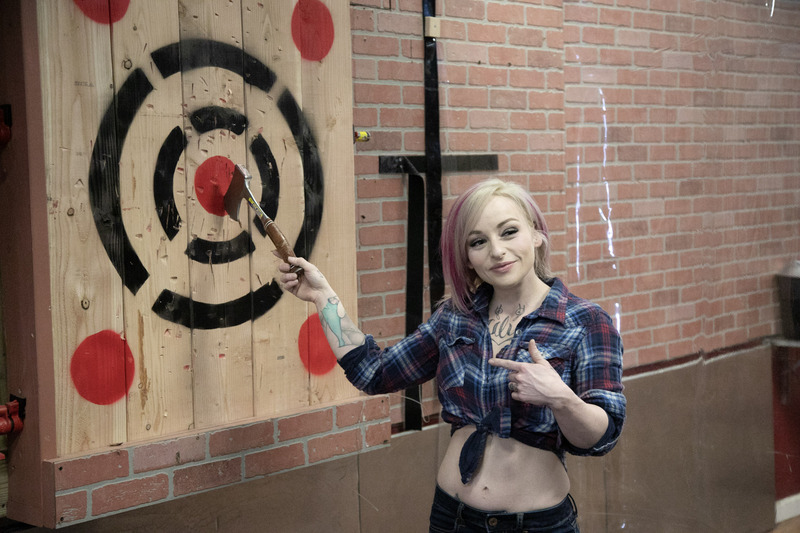 I am totally into axe throwing and want to do it day and night, seriously....I love it! Do you offer Kick Axe memberships? Well, we appreciate that and we love you too! Not like that, let’s be friends. Next year we will be introducing individual memberships where you can come in and throw or enjoy some of our other awesome activities. What is parking like near Axeholes? Metered street parking is available (bring quarters). Atlantic Street parking garage has paid parking and takes credit cards. Friday after 5pm-Monday 2 am you can park for free in the Mercer Street parking lot in any of the reserved parking spots. 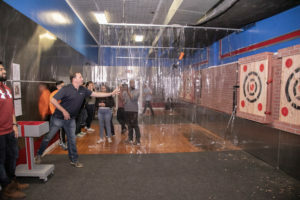 Birthday Parties, Team Building, Bachelor(ette) or Divorce Parties and more should be booked here! 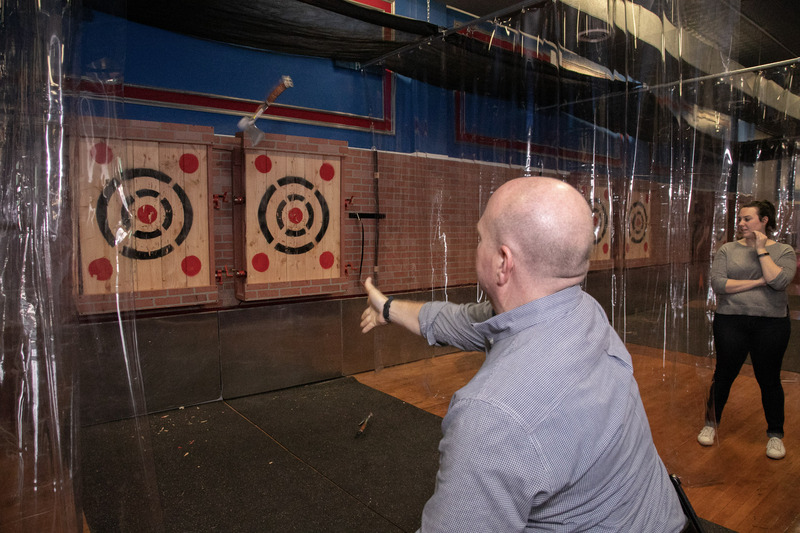 All parties that just include Hatchet Throwing can be booked online through our website.  If you want to combine Hatchet throwing with anyone of our other awesome activities or dinning please give us a call or click here to send an email. Normal? 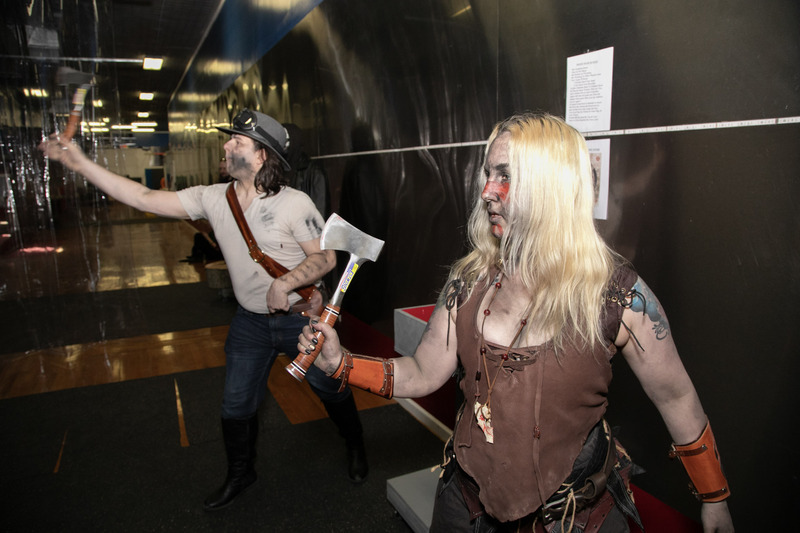 There is nothing normal bout us….we throw Hatchets for a living. Just ask and we will be more than happy to do our very best and accommodate your time and date. Unless you want to book for the 30th of February, we are always closed that day. Just busting your axe! There are no refunds however we will be glad to reschedule your visit as long as you give us at least 24 hours notice. Within 24 hours, however, there will be no rescheduling. If you were smart enough to get the insurance than you can reschedule at anytime for any reason. Go on…think of a good one! Can we Drink and Throw? Beer & Wine is allowed in moderation. Bag, Coolers and Purses will be searched anything other than Beer or Wine will need to be disgarded. We reserve the right to refuse service to any guests who appears under the influence or refuses to take a breathalyzer. There will be no credits, refunds or rescheduling for any such instances. Anyone who behaves in a disorderly, unsafe or threatening manner toward themselves or anyone else will be asked to leave without a refund. Ax-Perts instructions and rules must be followed and any one that doesn’t do so will be asked to leave without a refund. Are you ready to be amazing at Axe Throwing? ©2017 hatchethousenj.com. All rights reserved.